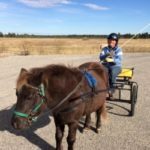 I see posts from time to time where people are sharing injuries they’ve gotten with their Miniature Horses, and letting others know that you can be hurt by a Miniature Horse, and you need to be aware. So it is great that those people are sharing those stories, and making people aware that small size does not automatically equal safe. However, I’d like to take that one step further. 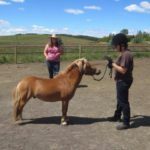 I think, in many cases, we get hurt – or worse, our horses do – because we didn’t take the concerns of our Miniature Horse seriously enough. Horses generally don’t give a crazy dramatic reaction without prior warning, and it’s important that we’re always paying attention to the signs they give us that they’re not comfortable, before they feel like they need to escalate to dangerous behaviour. There is a situation where a horse no longer gives the small signs of concern, and that is when they’ve been dismissed and ignored so often that they shut down. They know that nothing they do makes a difference, so they tune out the world and let you do whatever you want to them. These are often the horses that are touted as “bombproof” as they don’t react to anything. In many instances, a so-called “bombproof” horse is actually one who is in a state called Learned Helplessness. It’s unfortunately common in horses, and I’m afraid it’s even more likely in Miniature Horses, where they are small enough that we can make them do what we want, without necessarily resorting to the more dramatic “breaking” methods that might be seen in full sized horses. If a horse knows that their small protests don’t do any good, that someone is simply going to push, shove, or hold them down and do whatever they want anyway, they’re going to, sooner or later, give up and just stop reacting at all. Until, that is, something shakes them out of their state of learned helplessness, and suddenly the “bombproof” horse has a huge dramatic reaction and someone – horse or human – is going to get hurt. 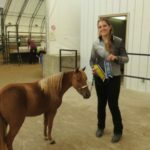 It’s not a big challenge to avoid this state of learned helplessness, or to listen to our horse’s concerns and make sure they have a voice in anything we do. Watch for the small signs they’re not comfortable with what you’re doing or asking, and if you see them, take a step back, let them take a breath, re-evaluate your approach and try to explain things in a way that makes them comfortable. I have an example of when I screwed this up, just this past spring – yes, I definitely knew better, but we all make mistakes, and it’s important to recognize them so we can continue to improve. Yearling Miniature Horses, for those who are new to the breed, have a winter coat that is very wool-like in consistency. In the springtime, as they start to shed, it mats just like sheep’s wool, and for comforts sake, I often give them a really bad, with the growth of the hair, clip job, just to take the mats and the bulk of the fluff off, while still leaving them some coat for the cool spring nights. Early this spring, I wanted to take the mats of Victor. I had a pre-conceived notion in my head of how this was going to go, as I’d clipped his full brother, Up, the previous spring without so much as a wiggle, and since Victor reminds me a great deal of Up, I was sure he would be just as comfortable with the clippers. I was wrong, but it took me longer than it should have to listen to what Victor was telling me. He pulled away from the clippers and I told him he was being silly and kept trying. He did his best to tell me that he wasn’t comfortable, and I kept telling him he was fine and just continued what I was trying to get done. Until Victor’s discomfort got to the point where he escalated his protests to rearing and striking and broke my glasses. With his foot. While they were on my face. I wasn’t hurt other than a few bruises and my favourite pair of glasses, but I knew right away that this was a situation I could have avoided if I’d just listened to him, taken his concerns seriously, and given him time to see that clippers weren’t that big a deal. The next time I needed to clip Victor, I began by letting him explore the clippers, rewarding him with a treat for touching the clippers, and then used classical conditioning to associate clippers with treats and got him properly clipped, for show, with no fighting and no fear on his part. And it took me an hour and a half to clip him, which is pretty much how long it takes me to do a show clip with an experienced horse. I suspect, if I’d ignored his concerns and fought a frightened, reactive yearling the whole time, it would have taken me a lot longer, and I’d have been setting up an experience that would affect his behaviour during clipping for the rest of his life. This comes up a lot in driving training as well. People think that because they’re small, they’ll just put on the harness and cart and see how it goes. It usually goes well, actually, the first time, as the poor horse is so overwhelmed – the scientific term is “flooded” – they aren’t able to respond. Anytime I hear someone say, “He was going so well and then he just went crazy!” or some variation thereof, I know they didn’t do their homework in the early stages of driving training, and the horse didn’t have the understanding, strength and skills to do what he was being asked to do. And this isn’t necessarily because of a person who intentionally (or unknowingly) rushed them through with a minimum of training. Miniature Horses are notoriously stoic, and they go along really well with the crazy things we ask them to do. It’s surprisingly easy, then, to have them already driving in the show ring before the horse “suddenly” reacts because they didn’t truly understand all those other steps. 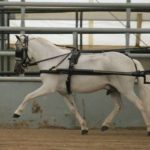 My online course on starting your Miniature Horse in harness includes ways to identify that your horse has understood each skill, and what signs to watch for that might indicate they are just “being good” and going along, and aren’t truly understanding and ready to move on to the next stage of training. If we make a conscious effort to listen when our horse says they are uncomfortable, regardless of the situation, and adjust our approach accordingly, not only are we far more unlikely to reach the point where the horse feels they need to react in a dangerous manner, but we’ll be improving our relationship with our horse every single time that we let them know we hear their concerns and make adjustments to help them be more comfortable. The small size of a Miniature Horse doesn’t mean they can’t react in a way that is dangerous to us or to them. 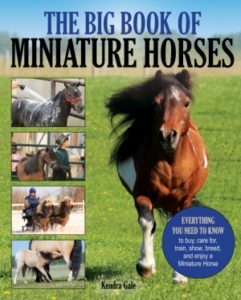 We need to take our Miniature Horses seriously. We can do better. Great job Kendra, This is a well put together article, seamless transitions excellent information and very entertaining.